‘Jeannie who’ I wondered, what Jeannie in 2000 could cause such a stir of excitement? I went to the guard at the door and tried to claim I was just going to shop – but no dice “Gotta get in line, all the other men are dreamin’ of Jeannie too, bud.” That Jeannie?! I was filled with excitement and headed around the corner to the back of the line, with at least 100 – 150 men ahead of me. What was so extraordinary about this frenzy was . 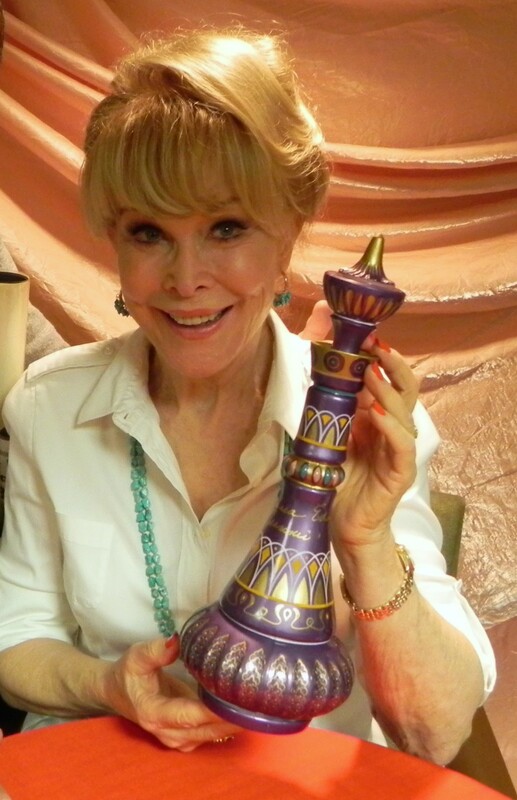 . . this was way before Barbara Eden was heavily promoting the old beloved TV series as she does now and signing replicas of the famous bottle. She was there to promote the now defunct Cygion Cyber Genie, a micro PBX cordless phone system. Since it was a promotional tour, her time schedule was limited. You could hear the J&R personnel saying that they had not expected such an enormous turnout. So, by the time I got inside the door, only to see her far on the other end of the store, the announcement was made, “I’m sorry fellas, but Miss Eden would love to meet you all, but she has to go.” That started a big roar of boos but also wolf call whistles to let her know how ‘hot’ they thought she was. 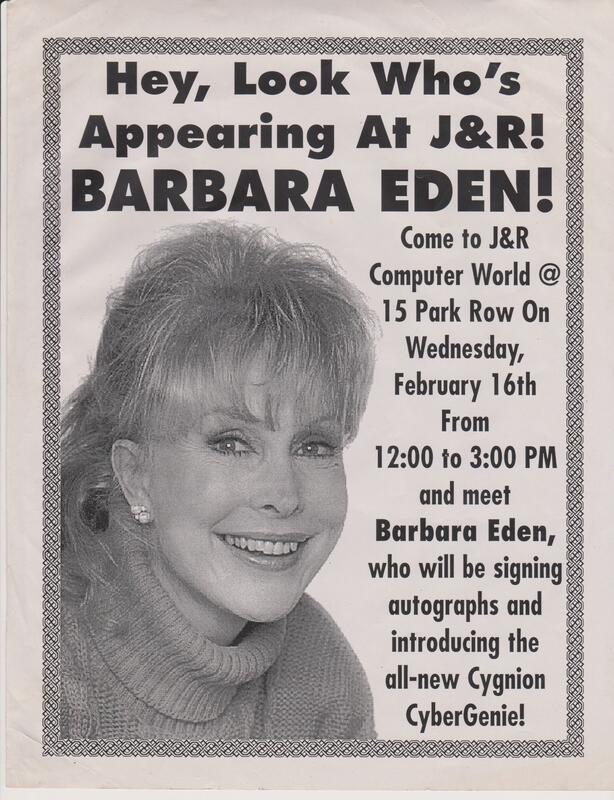 Now in retrospect, I think working for Cygion must have been part of the wake up call to Barbara Eden to realize how still very beloved and popular she was thirty years after the show’s end. The wait was worth it. She was and is radiant. She beams love. There is an incredible gentility to her. She looked amazing! There was a man selling replicas of the bottle, which I had, had to have! I bought the bottle clenching it in my hand as I waited to meet Jeannie forty years later! How is it that I had aged and Jeannie hadn’t…yeah I know, she really is a genie! The moment came, I was next in line! My heart pounded, my palms started to sweat, my knees a little shaky, this was so surreal…a few steps more…a few steps more and I was in the arms of Barbara Eden. I had died and gone to heaven! In 2010 I had met an extraordinary amount of celebrities on my wish list, including my obsession Cher (whom I had met before), but out of allll those stars, it was Jeannie that was the biggest thrill. To look at my nightstand today and see the signed bottle next to my bed is awesome, so I can truly ‘dream’ of Jeannie ♥.